On the outbreak of the First World War in 1914 Eveline Haverfield founded the Women's Emergency Corps, an organisation which helped organize women to become doctors, nurses and motorcycle messengers. Christabel Marshall described Haverfield as looking "every inch a soldier in her khaki uniform, in spite of the short skirt which she had to wear over her well-cut riding-breeches in public." Elsie Inglis, one of the founders of the Scottish Women's Suffrage Federation, suggested that women's medical units should be allowed to serve on the Western Front. With the financial support of the National Union of Women's Suffrage Societies (NUWSS), Inglis formed the Scottish Women's Hospitals Committee. Soon satellite committees were formed in Glasgow, London and Liverpool. The American Red Cross also helped to fund the organisation. 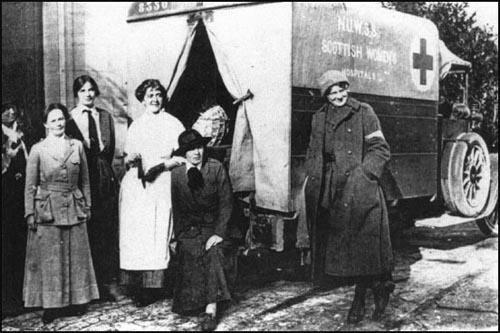 Although the War Office representative in Scotland opposed the idea, Dr. Elsie Inglis and her Scottish Women's Hospitals Committee sent the first women's medical unit to France three months after the war started. By 1915 the Scottish Women's Hospital Unit had established an Auxiliary Hospital with 200 beds in the 13th century Royaumont Abbey. In April 1915 Elsie Inglis took a group of women to Serbia on the Balkan Front. Over the next few months they established field hospitals, dressing stations, fever hospitals and clinics. During an Austrian offensive in the summer of 1915, Inglis and some of her staff were captured but eventually, with the help of American diplomats, the British authorities were able to negotiate the release of the women. During the First World War Inglis arranged fourteen medical units to serve in France, Serbia, Corsica, Salonika, Romania, Russia and Malta. This included doctors, nurses, cooks, ambulance-drivers, orderlies and relief-workers. In 1916 Eveline Haverfield was appointed as Commandant in Chief of the Women's Reserve Ambulance Corps. She was instructed to organize the sending of the Scottish Women's Hospital Units to Serbia. On 5th July, 1916, Elsie Bowerman wrote to her mother: "Mrs Haverfield has just asked me to go out to Serbia at the beginning of August, to drive a car - May I go? I know Miss Whitelaw would let me off Wycombe to go. It is what I've been dying to do & drive a car ever since the war started. I should have to spend the week after the procession learning to drive - the cars are Fords - if I went I would come home when I come back I would not have to go to W.A. It is really like a chance to go to the front. They want drivers so badly. So do say yes - It is too thrilling for words." 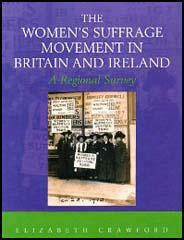 The London Suffrage Society financed Elsie Inglis and eighty women to support Serbian soldiers fighting in Russia. Evelina Haverfield, one of the leaders of the suffrage movement was recruited as head of transport. One government official who saw the doctors and nurses working in Russia remarked that: "No wonder England is a great country if the women are like that." In September 1916 Ishobel Ross wrote: The wounded have been coming in all day, nearly all frightfully bad cases. We have our kitchen now, it is like an Indian bungalow all made of rushes. From the window we can see the ambulances arriving at the reception tent, and the poor men carried in. All the Serbs working in the camp are so pleased to have the hospital started at last, and indeed we are too. Poor Ethel is in the surgical ward and has had an awful day of it - three of the men, very badly wounded in the head, died tonight. We get the worse cases here and some of the wounded have been lying untended for two days. In 1917, one of the nurses, Katherine Harley, aged 62, was killed by a shell at Monastir in Tunisia. 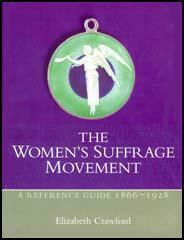 According to Elizabeth Crawford, the author of The Suffragette Movement (1999): "She worked both in France and Serbia. Not an easy colleague, and not one happy to take orders, she was killed by a shell at Monastir, where, as one woman doctor laconically noted, she had no need to be." (1) Dr. I. Hutton described the state of the patients that the women nursed at the Royaumont Abbey Hospital. It was bitterly cold. The patients who were not in a raging fever shivered and tried vainly to adjust their tattered uniforms to gain a little warmth. Their clothing crawled with maggots and bugs and their bodies with lice. Dying men lay huddled so closely together on the floor that they touched each other. Others sat up gasping and blue in the throes of pneumonia. Blood and pus oozed from the wounds. A few of the patients feebly extended their hands but most of them were too ill to care what happened. Seventy-odd soldiers, in the last stages of dysentery lay crouched along the walls, emaciated, dying. They crawled outside from time to time. There were no sanitary arrangements and the grass plot was foul. Mrs Haverfield has just asked me to go out to Serbia at the beginning of August, to drive a car - May I go? I know Miss Whitelaw would let me off Wycombe to go. It is what I've been dying to do & drive a car ever since the war started. I should have to spend the week after the procession learning to drive - the cars are Fords - if I went I would come home when I come back I would not have to go to W.A. It is really like a chance to go to the front. They want drivers so badly. So do say yes - It is too thrilling for words. (4) Mairie Chisholm was only twenty when she began working for the Women's Hospital Unit. Taking wounded to hospital fifteen miles back at night was a real strain - no lights, shell-pocked pavie roads mud-covered, often under fire, men and guns coming up to relieve the trenches, total darkness, yells to mind one's self and get out of the way, meaning a sickening slide off the pavie into deep mud - screams from the stretchers behind one and thumps in the back through the canvas - then an appeal to passing soldiers to shoulder the ambulance back to the pavie. Two or three of these journeys by night and one's eyes were on stalks, bloodshot and strained. It is extraordinary how these women endure hardships; they refuse help and carry the wounded themselves. They work like navvies. No wonder England is a great country if the women are like that.